The online casino industry has become way more competitive in the wake of the 2006 UIGEA, which is good news for players: deals are now sweeter and players are valued a whole lot more by the various operations. In the same time though, online casino operators have pretty much caught up with various bonus whoring schemes and implemented measures meant to stop such abusive moves on the part of the players. Bonus hunting has always been an integral part of the online casino experience. Picking the right online casino, which offered the right type of bonus was halfway to success for many a player. To this very day, online casino selection based on the bonuses offered remains a viable way of securing extra value for players. There are no two similar bonuses on the market. Some bonuses are larger ones, others are smaller: in the case of online casino gambling, the size of the sign-up bonus is not as important as the redemption requirements that come with it. In online casino gambling, unlike in online poker, sign-up bonuses are transferred into players’ real money accounts right away. That’s good because players will quite literally be able to use their bonus to unlock their bonus. As soon as they land there, players will be bound by the redemption requirements: they won’t be able to cash out until they fulfill them. The deal differs from one online casino to another: some casinos will allow players to cash out their initial deposits, in which case they’ll automatically forfeit the bonus. Other casinos won’t allow players to cash out anything. Much more important than the size of the bonus and pretty much everything else concerning it are the redemption requirements. In online casino gambling, redemption requirements are also known as turn-over or play-through requirements. Players will have to turn their sign-up bonuses around a set number of times (it depends on the casino how many times it’ll require its players to play their bonuses through) in order to earn the right to cash it out. This is where not so long ago bonus hunters found a great breach in the system. They would take their money to the roulette tables and bet an equal amount on Red AND black, or odds AND even. That way they would always lose one of the bets, but they’d win it right back on the other. The existence of the green “0” meant that they had a bit of adversity to deal with, but the system would generally work fine. This way, they would fulfill their turn over requirements and be left with the sign-up bonus they could cash out. Casinos usually catch on fast when it comes to such schemes though and online casinos are no exception. Nowadays, games like roulette are either completely excluded from the list of games that can be used for the turn over requirements, or the types of bets are limited on them. Some casinos have taken this approach even further: they have ruled out all of the games except for the ones on which the house edge is the biggest. Your task as an online casino player is to find a casino with reasonable redemption requirements. Red Flush online casino is an award winning establishment that has been available to players since the middle of 2008, and has already won many awards within the online gaming community. Red Flush have over 550 Microgaming games that are bound to keep you glued to your seat. These games are updated on a month to month basis, keeping the collection of games fresh and stimulating. 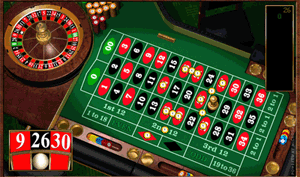 The games encompass extensive table games, video slots games; classic slots; parlour games as well as progressive jackpots. Everything you would expect from a great online casino and more can be found at Red Flush.